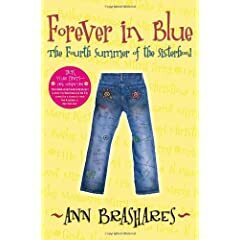 Forever in Blue, The Fourth Summer of the Sisterhood by Anne Brashares. This book had a lot of low points for me, but a few high points too. I’m a big fan of this series. #3 was my favorite. If you haven’t read this one yet, I’m going to try not to give too much away. As in each Sisterhood book, there are four concurrent stories happening. Each story was frustrating in the way of soap operas. You can see the character obviously making bad choices, but because of pride/love/embarassment/stupidity/etc. they continue on a destructive path. This happened a lot in this book. I don’t remember it being so obvious in the other books. I was sad that Carmen didn’t figure as prominently in this book, as she’s always been my favorite character. I’d love to discuss this book with someone that’s read it, because I want to talk about how each girls’ story ended – but I don’t want to give anything away. All that said, I read it in two days. I liked that the author made the girls seem older, through language if anything. Although, sometimes, I didn’t buy that a 19/20 year old girl would think/say the things they were thinking/saying. But still…I recommend it. It’s a satisfying ending to a great series. I have read all these books. Just finished Forever In Blue a few weeks ago. I love love love this series! I feel like these 4 girls are old friends. I’m so sad there aren’t going to be more. I hope Ann continues to write. She’s so talented. I am a huge fan of the young adult genre of fiction but it has to be well written. Sarah Dessen is another fave YA author of mine. Excellent writer. As for this series the first book was my favorite. I cried and cried at the end. As for this book, I think Tibby’s storyline was my favorite. I felt so bad for Brian when she treated him like that. I couldn’t help but be happy when she found out he was going out with Effie. But I knew they’d get back together. I just got some Sarah Dessen books from the library. You know who else I love in the YA world? Joan Bauer! She’s awesome. I loved this series too – I read the fourth one last summer and thought it was great. Sarah Dessen is great too. You should try Laurie Halse Anderson if you haven’t. I just finished Twisted and really enjoyed it. I did enjoy this book, but it was my least favorite in the series (I cried a lot more with the others…) I love Sarah Dessen as well! Really well written books. My daughter enjoys Joan Bauer’s books. Yeah, my least favorite too. Although, I totally cried when Bridget cooked dinner with her dad and brother.